We realize that the framing of your artwork is a personal thing. So, to order a print custom framed just for you, please feel free to call or Email us with your desires. Chances are we may already have one framed that meets your needs. If not, we’ll do one just for you. 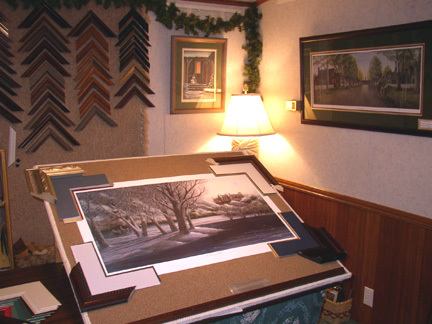 By using our custom framing services, you may even send me pictures of the wall or room where you plan to hang the artwork including pictures of your colors and fabrics. When everything is done, we can email a picture to you for your approval before we ship your piece. We want you to be happy and enjoy your artwork for many years to come. Whether you are in or out of my area, I would like to invite you to come by my gallery and frame shop here on the farm. Just give us a call to let us know when you would like to come. We will be there with a fresh pot of Felix’s famous coffee. And, there’s always a bottle of wine in the fridge.